Derek is using Smore newsletters to spread the word online. 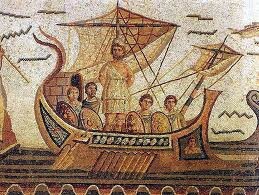 In 1988, scientists discovered an ancient ship that may have been sailed by Odysseus, Homer's legendary Greek King. Where did Odysseus, the hero of Homer's epic poem The Odyssey, call home? This is Odysseus's voyage. The sea breeze pushed him and his crew off course to a foriegn island. Odysseus's crew finds a cave. They sit there and wait, and then a giant man with 1 eye comes in with a load of sheep. After a while, Odysseus gives the Cyclops a lot of dark red wine. The giant then gets drunk and vomits, before falling asleep. Odysseus sharpens a wood stick, then stabs it in the Cyclops eye, and puting all his weight on it, ends up blinding the harmful creature. When the Cyclops realizes whats happening, he tries to find them, but they escaped under sheep. That is how they got away. 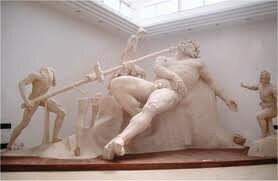 Things that make Odysseus a hero. Odysseus is brave, because he was taking on the risk of getting lost at sea. Also, he decided to explore the foriegn island and leading his men to the cave. He is a genious for getting the Cyclops drunk, then blinding him to escape. Then escaping by getting under sheep to camoflage. 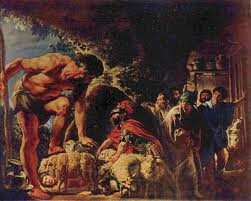 He was also courageous by convincing his men to stay calm and not to attack the beast. Another thing was that he didn't show his emotions in front of his troops, so they wouldn't give up.